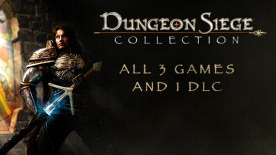 The Dungeon Siege Collection contains every Dungeon Siege Game released for PC, as well as the incredibly successful DLC for Dungeon Siege III - Treasures of the Sun. Dungeon Siege II - It’s been a generation since you vanquished the evil that plagued the Land of Ehb, and now…a new menace has awakened. In Dungeon Siege II, the sequel to the best-selling RPG from Gas Powered Games, you will be called on to again wield sword and spell to save the world from a growing abomination many years in the making. Dungeon Siege III - For centuries legionnaires have protected the nation of Ehb until they were betrayed and all but driven to the brink of extinction. Now that evil has returned to Ehb the people turn to the few remaining Legionnaires for the protection of the past. As an heir to the legion will you accept this plea for help? How it will all be resolved is up to you!